Code 43 usually means that the required device is unidentifiable. The computer tries to access and synchronize correctly with the device but fails to do. This usually occurs when you install a new driver, install a new update, or are running Lucid Virtu MVP. We will start by checking if the graphics card is inserted correctly into the slot. Then we will move on to software solutions including uninstalling the device and install the default drivers. In the last stage, we will update the BIOS of your computer also tweak around Windows Update. Before we move on to diagnosing the problem through software workarounds, you should first check if the graphics card is inserted correctly inside its slot. Press it firmly and make sure all the pins are inserted firmly. If you have a laptop, just perform the power cycle as explained below. Press Windows + R, type “devmgmt.msc” in the dialogue box and press Enter. 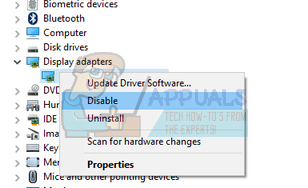 Once in the device manager, expand the category of “Display adapters”, right-click on your device and click “Disable”. Now turn off your computer. Take out the battery (in case of a laptop) or take out the main power cable (in case of a PC). If you have a PC, open its lid and make sure that the graphics adapter is inserted perfectly into the pins. 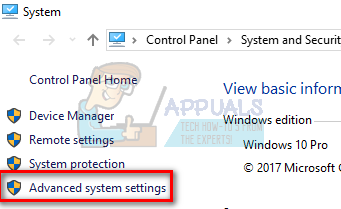 After performing the above steps, start your computer back, enable the hardware the same way we disabled it, and check if it is working correctly. After the latest Windows update, NVIDIA issued an official statement that the software Lucid VIRTU MVP isn’t compatible with NVIDIA devices and is causing discrepancies which are resulting in various problems including the one we are experiencing. 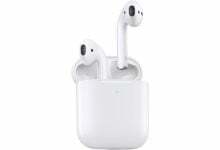 This software primarily allows you to switch between your onboard graphics and your discrete graphics card. 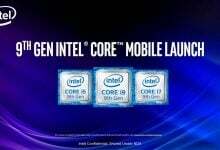 It is a very useful tool but it seems it isn’t workable with NVIDIA software. Press Windows + R, type “appwiz.cpl” and press Enter. You will see all the applications installed on your computer in front of you. Search through them for “Lucid MVP” software, right-click it and select “Uninstall”. 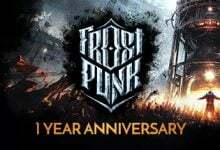 After uninstalling the application, restart your computer and check if the problem got solved. If the hardware still gives an error 43 code, try disabling it and then re-enabling it. Windows roll out important updates targeting the bug fixes in the operating system. One of the bugs in our case; NVIDIA hardware giving the error message. If you are holding back and not installing the Windows update, we strongly recommend that you do. Windows 10 is the latest Windows operating system and new operating systems take a lot of time to get perfect in every regard. After updating, restart your computer and check if your issue got fixed. Faulty Graphics drivers are also known to be a cause of this issue. Drivers are the main driving force behind any hardware connected to your computer. If they are corrupt or outdated, it may cause the error to pop-up again and again. 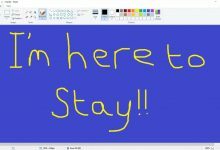 We will start your computer in Safe Mode and delete the currently installed drivers for your display card. Upon the restart, the default display drivers would automatically be installed upon the detection of your display hardware. Follow the instructions on our article on how to boot your computer in safe mode. Once booted in the safe mode, right click on Windows key and select Device Manager from the list of options available. Another way to launch the device manager is by pressing Windows + R to launch the Run application and typing “devmgmt.msc”. Once in the device manager, expand the Display adapters section and right click on your display hardware. Select the option of Uninstall device. Windows will pop a dialogue box to confirm your actions, press Ok and proceed. Now restart your device. Now check if the error is resolved. If all the above solutions don’t work, we can try updating the graphics driver. 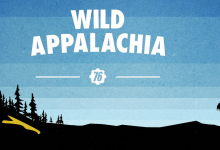 It may be possible that your graphics driver is not properly configured or is outdated. 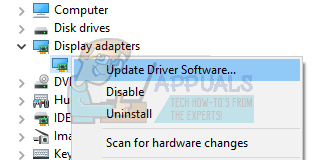 We need to completely delete all driver files before we install the new driver, therefore, we need to use the utility Display Driver Uninstaller. You can download the utility over the internet easily. 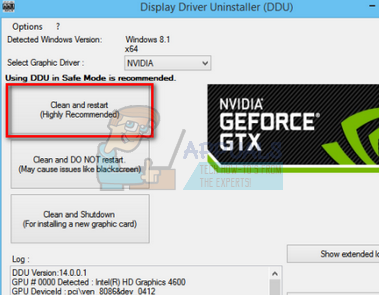 After installing Display Driver Uninstaller (DDU), launch your computer in safe mode. You can learn how to boot your computer into safe mode by reading our article on it. After booting your computer into safe mode, launch the application which was just installed. Choose the option Safe Mode. After launching the application, select the first option “Clean and restart”. 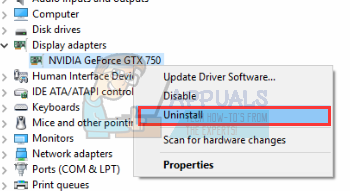 The application will then automatically uninstall the installed drivers and restart your computer accordingly. Boot your computer into normal mode and launch the application. 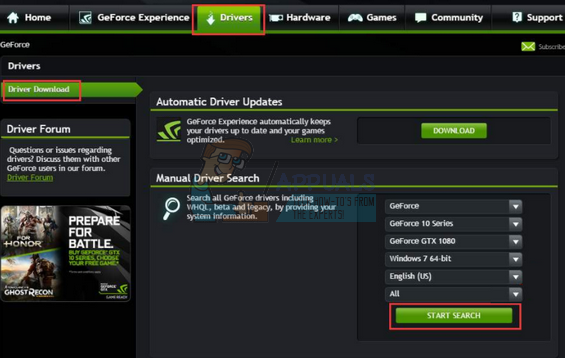 Launch the GeForce Application, open the “Drivers” tab and click the button “Driver Download”. Enter your specification on the right side of the screen and click “Start search” for the application to search for the optimal drivers for your computer. After the driver is updated, restart your computer and check if the problem got solved. 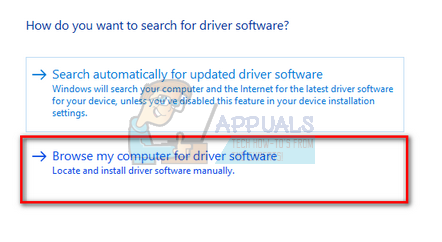 If installing the latest drivers don’t work (like in many cases), you should perform the following steps to make sure that the drivers don’t get updated automatically by Windows Update and install a driver of a previous version. Press Windows + S to launch the search menu of your start bar. Type “system” in the dialogue box and select the first item which returns in the result. Once in the system, click on “Advanced system settings” present at the left side of the screen. 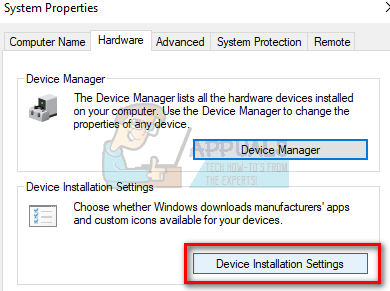 Navigate to the Hardware tab and click on “Device installation Settings”. Select the option of “No (your device might not work as expected)”. Press Save changes and exit. 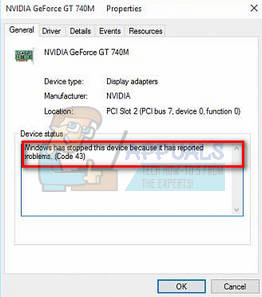 This will disable the Windows update from updating your graphics drivers automatically. Now press Windows + X to launch the quick start menu and select “Device Manager” from the list of options available. Once in the Device manager, expand “Display adapters” category. Right-click on the hardware and select “Update Driver Software…”. Select the second option “Browse my computer for driver software”. Now navigate to the location where you downloaded the driver package and install it. After installing it, reboot your computer completely and check if the problem at hand got solved. BIOS stands for Basic input/output System and it is a firmware used to perform the hardware initialization during the booting process of your computer. The BIOS system is preinstalled on your computer by your manufacturer and it is the first software that runs when your computer is started up. It is more like a key which starts all other processes on your computer. The BIOS is also responsible to test hardware components on your PC and make sure that they are working properly without any errors. Most of the BIOS are designed specifically to work with a specific model or motherboard. Traditionally, BIOS was written in ROM and hardware needed to be replaced when updating the BIOS. In modern computer systems, BIOS is stored in flash memory so it can be rewritten without the menace of replacing the hardware. There were numerous reports that updating the BIOS of the computer solved the problem instantly but we kept it is a last resort as it is very technical. Backup your data completely before resorting to this solution. Also, consider reinstalling your BIOS even if it is updated to the latest build. We have a number of different articles targeting how to update the bios of your machine (search this site for bios update).